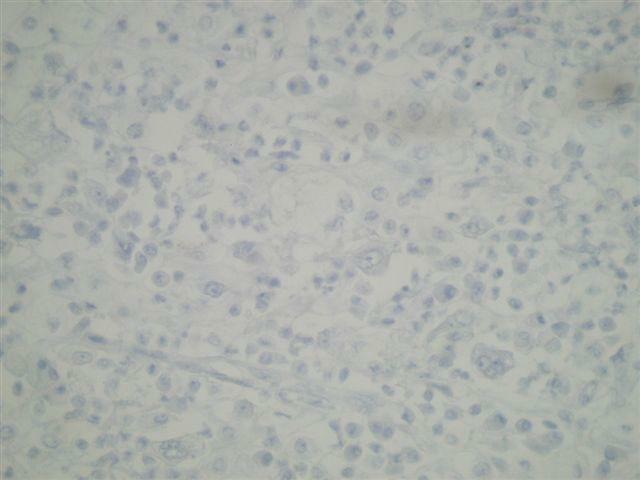 (1) We added a new article to our Management Page - Coding Prostate Saturation Biopsies, by Laura Edgeworth, PSA, LLC. Click here for the article or you can access the Management Page from the center section of our Home Page. (2) Our Thyroid chapter, which was recently extensively updated, has been reviewed by Shahidul Islam, MD, PhD, Director of Cytopathology, The Ottawa Hospital, Ontario, Canada. (3) We added a new article to our Management Page - Billing Contracts verses Managed Care Contracts, by Mick Raich, Vachette Pathology. 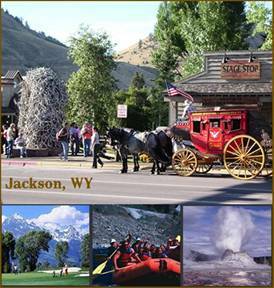 Click here for the article or you can access the Management Page from the center section of our Home Page. 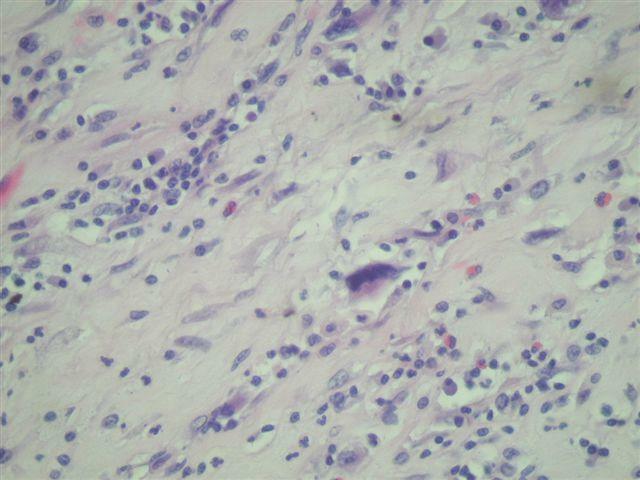 (4) Do you have good examples of Ovarian-nontumor pathology? 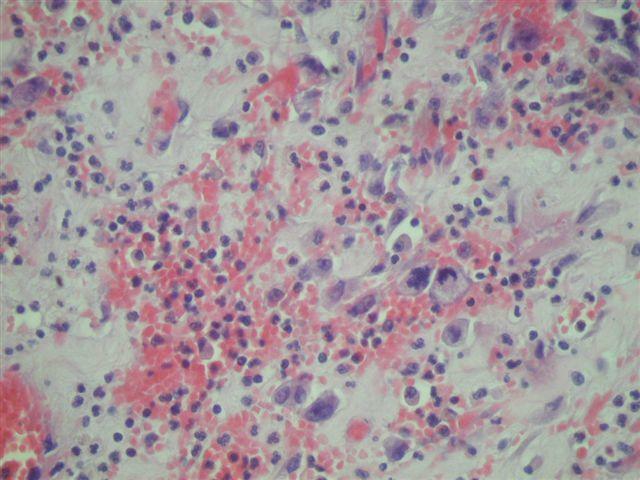 Help your fellow pathologists worldwide by contributing these images to PathologyOutlines.com, where they will be viewed on a regular basis. To view the images or references in this Case of the Week, you must click on the links in blue.� Links in green are to journals with free full text-no registration.� You can also access these cases by visiting our Home Page, then click on the Case of the Week button on the left hand side. 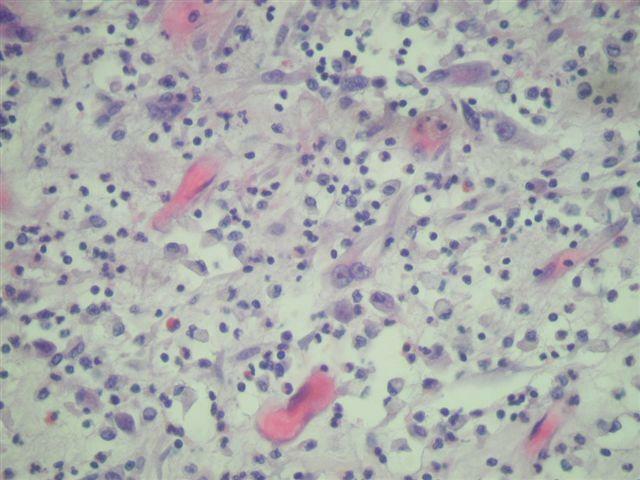 Thanks to Dr. David Cohen, Herzliya Medical Center, Israel, for contributing this case.� To contribute a Case of the Week, email NatPernick@Hotmail.com with the clinical history, your diagnosis and diagnostic microscopic images (textbook quality) in JPG, GIF or TIFF format (send as attachments, we will shrink if necessary).� Please include any other images (gross, immunostains, etc.) that may be helpful or interesting.� We will write the discussion (unless you want to), list you as the contributor, and send you $35 (US dollars) by check or PayPal for your time after we send out the case.� Please only send cases with high quality images and a diagnosis that is somewhat unusual (or a case with unusual features). A 63 year old man presented with a massive tumor adherent to his stomach, right colon and gallbladder. 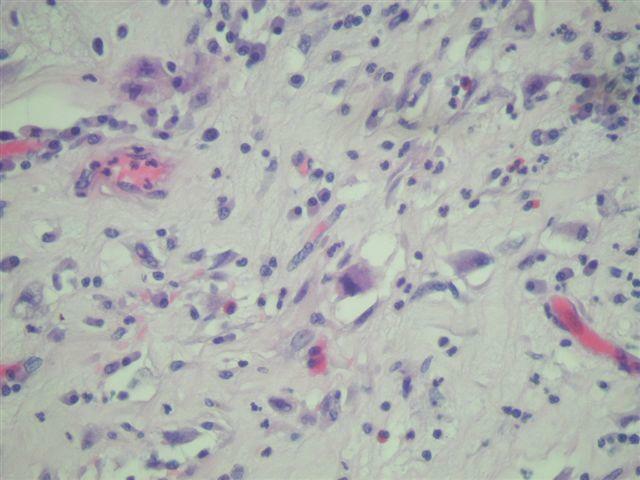 �Seventeen years prior, he had an extraskeletal osteosarcoma of the right kidney, which was excised. 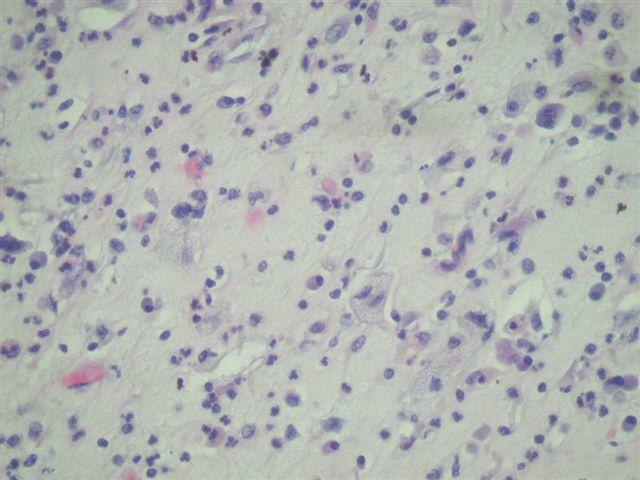 The sections show marked granulocytes with occasional eosinophils, plasma cells and lymphocytes.� The inflammatory cells obscure the markedly pleomorphic tumor cells, which have prominent eosinophilic cytoplasm and markedly atypical nuclei.� Some tumor cells have prominent nucleoli and resemble Reed-Sternberg cells.� Other tumor cells contain phagocytized neutrophils.� No well differentiated liposarcoma areas were seen. 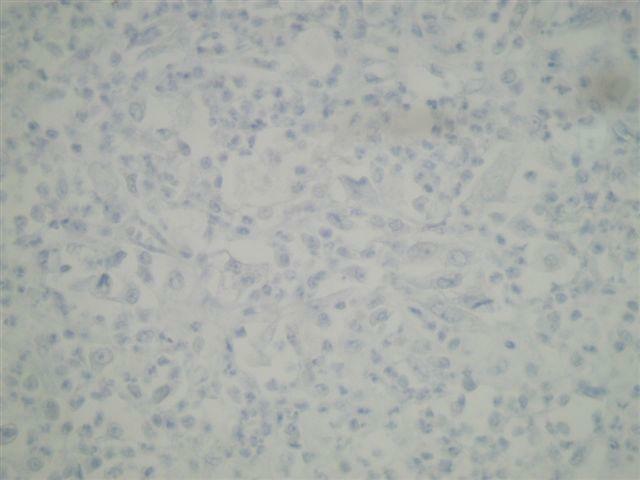 Immunostaining shows tumor cells that are immunoreactive for CD68, but negative for melanocytic markers Melan A, S100 and HMB45; epithelial markers EMA and AE-1; and lymphocytic markers CD3, CD20, CD45, CD15 and CD30.� They are also negative for vimentin, CD117, CD34 and smooth muscle actin. 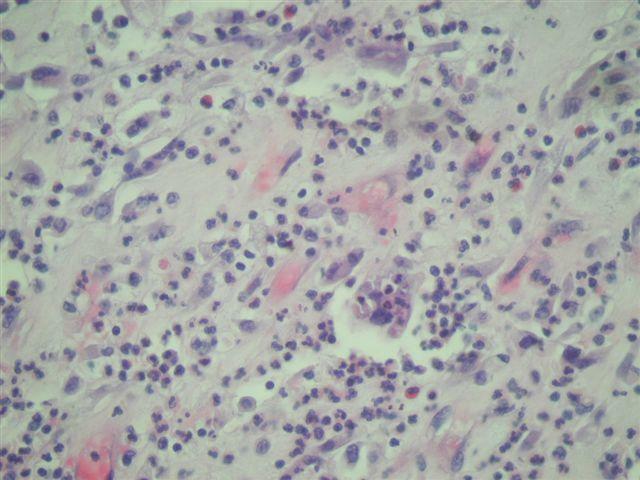 Inflammatory MFH is defined as a very rare tumor of neoplastic histiocyte-like cells mixed with and often obscured by neutrophils and other inflammatory cells.� Most of these tumors are probably dedifferentiated liposarcomas, based on classic liposarcoma areas and immunoreactivity for MDM2 and CDK4 and 12q14 amplification (J Pathol 2004;203:822).� Clinically, they may be associated with fever, leukocytosis and eosinophilia. 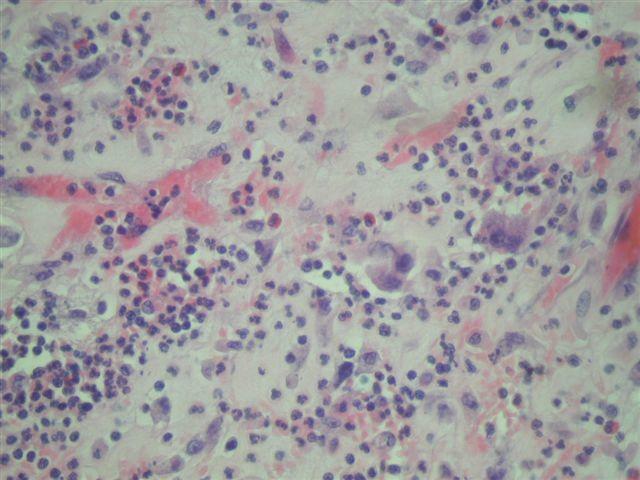 The differential diagnosis is broad.� Besides dedifferentiated liposarcoma, it may include xanthogranulomatous pyelonephritis (Int J Urol 2006;13:1000), other reactive lesions, inflammatory myofibroblastic tumor, Hodgkin�s or anaplastic lymphoma (Mod Pathol 1997;10:438), melanoma, and metastatic renal or adrenal carcinomas. These tumors have traditionally been considered to have a very poor prognosis, although many prior studies include tumors which would now be classified differently.